Focusing on a brighter future can be a challenge when all around us seems hopeless and desperate. Wars. Poverty. Inequality. Injustice. If you’re a regular consumer of the nightly news, this is all you see. Night after night. Week after week. It’s hard to stay positive and motivated in the face of such relentless negativity. Time to take charge of your money, your life and your future! Seeking a brighter future requires energy, knowledge and commitment. The most important thing to remember though, is this: you only need to change YOUR OWN FUTURE and not the whole world. If you take responsibility for creating your own brighter future, you’ll not only start achieving great things, you’ll also set a wonderful example for your friends and family to follow. A brighter future is not the stuff of wishes and hopes, it is the result of plans and actions. Here are the six basic steps to get you moving on your action plan. It’s not rocket science but you will need to put in some effort. I think you’ll agree that a future filled with financial security is worth it. 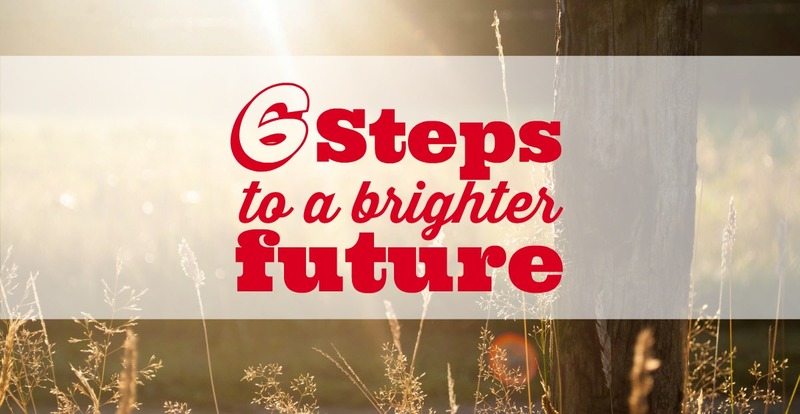 Are you hoping for a brighter future? 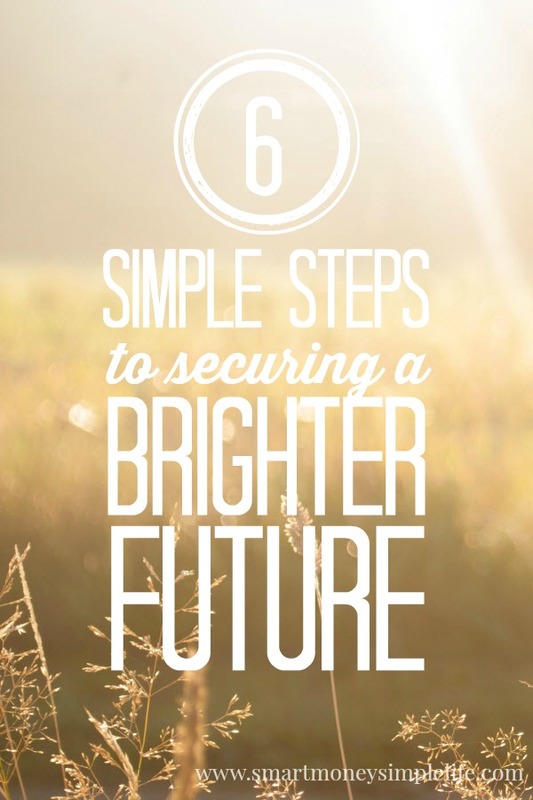 Time to take charge of your money, your life and your future with these six simple steps! Learn all you can about making, saving and investing money. Knowledge is power but knowledge plus action is powerful. Learn. Research. Ask questions. The better you understand how money works, the more effective your plans will be. Don’t let a lack of knowledge stand between you and your brighter future. It seems everyone these days has heard of S.M.A.R.T. goals (specific, measurable, attainable, realistic and timely) and they are definitely useful. The first thing you need though, is a vision. Having a vision, knowing WHY you want to achieve a goal, is just as powerful as setting out the steps for achieving it. Take some time to think about how you want your life to be in the future and what it will feel like to be living it. That feeling is the one that will get you through the tough times. Don’t allow yourself to employ any ‘when, then’ scenarios. You know the type, “when I get my next pay rise, then I’ll start a savings plan”. Start right now. It doesn’t have to be a perfect plan; there’s no such thing anyway. Start working your plan immediately, when you find kinks in the process you can change your plan to better suit your current situation. We all have good and bad habits when it comes to handling our money. If you know you have a weakness for shiny objects: fashion or home accessories or you love to eat out or, like me, you love going to the movies, then work a small amount into your budget for these indulgences. Don’t completely deny yourself – it always backfires. If you’re always forgetting to pay bills on time, find a way to automate the process that still gives you control of your money. If you never have anything left at the end of the month for saving then save first. When you know your strengths and weaknesses you can plan around them and ultimately use them to your own advantage. Being optimistic about a brighter future doesn’t mean leaving your future in the hands of the fates. It means being responsible for your own future and that requires not just insurance for your assets but also your financial future. None of us has a crystal ball so we can’t know for sure what will happen in one, 5 or 20 years. Job loss. Divorce. Major illness. We need to apply the theory of ‘hoping for the best but planning for the worst‘. What steps can you take to protect your finances should any of these situation occur? Life insurance, income protection, emergency fund… what do you already have in place, what will you need to acquire? Taking the time to make sure you’ve got all the basics covered will save you a lot of time and money over the long haul. Make sure you’re getting the best deals on everything from your mortgage to your health insurance. Consolidate where you can to save fees and get discounts. For example: make sure you’re not being hit with ATM fees by planning your cash requirements from one pay day to the next and use your own bank’s ATM. Free up whatever money you can for debt repayment or investment and work your plan. The stark reality is that most people hope for a brighter future but few actively work toward achieving that goal. Be one of the few who are not leaving their future financial well-being to chance. Start planning for your brighter future today. Do you have all these basic steps covered? What else would you recommend? I think these are great tips! I feel like I’m covering most of the basic steps but there is always room for improvement. Thanks Holly! It’s true, it’s a process and we learn as we go. Great post! Love the image you created as well. Setting goals can really help!